When only a boy, his dad, Andy's Grandpap, put AJ, Andy's Uncle into a boat, wished him luck and the rest is history! Today AJ's on the boats more than he's on the land - which seems to be the way he likes it! He and his father share the Love of the Sea, and they taught and shared that love with Andy. They were indeed the 'main men' in Andy's life - the men who shaped his world and his way of living it. Andy's Tribute Painting to Grandpa Anderson And "Sea Fever"
Grandpap Anderson retired as a commercial Air Lines Pilot, but his true love was for The Sea. 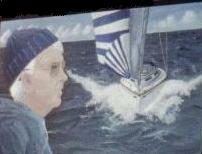 His sail boat "Sea Fever" was his 'home'. Grandpap and Uncle AJ on the "Sea Fever"
Here Grandpap and Uncle AJ enjoy their passion for the sea together on "Sea Fever". Andy, 3 years old, and his father Steve aboard "Sea Fever"
Cpt. A.J. Anderson - "Skipper" of the Rasselas as she launches for her Maiden Voyage. Although Grandpap Anderson and Andy were gone before the launching of AJ's pride and joy, there's no doubt they were looking down upon this event...and smiling all the while. "A Young Man of the Sea Sails Forward"
That was the headline of the article appearing in the Fort Lauderdale News, Thursday, September 11, 1980. You might not be familiar with the Cyrano, but you will probably be familiar with William F Buckley - author and journalist. It was on the Cyrano that Buckley sailed across the Atlantic Ocean sometime in the 1970s. That voyage was the basis of his book Airborne. How then...and why...was a 23 year old AJ Anderson charged with the title 'skipper' of the Cyrano? It all started when AJ was a youngster who just "didn't like baseball ...I was better at that than baseball" says AJ. With his father, he completed his very first long ocean voyage as a teenager leaving Connecticut for West Palm Beach on a 37 foot sailboat. The rest, as they say, is history. Bob Johns, from Texas, purchased the Cyrano and AJ became her skipper. And...to coin a phrase....'now you know the REST of the story'! Bob Johns found Cyrano decaying in Thunderbolt, Georgia. AJ was working for Gary Wheatley at the Palmetto Bay Marina and the boat was towed over there and as AJ says, everything, including the kitchen sink was replaced. There were 400 copies of Bill Buckley's book "Airborne" onboard and some of the family were lucky enough to score a copy. We cannot recommend enough Airborne to visit a life we live, here in the lowcountry, a trans-atlantic trip of a lifetime described as if you were there. To see what the young Capt AJ has been up to lately, we encourage you to visit his website, www.wrightmaritime.com. As AJ tells us, we have enough Andersons around, let's honor MOM! Patsy Lou Wright, as her headstone reads as the Beaufort National Cemetery. Thank you, AJ, for honoring a great woman, a great lineage. A great tribute to a great lady. Andy's Grandmother, more fondly called "Crackers" was a Marine. She enlisted at the age of 20 and the photo was taken by and published in the Cincinnati Enquirer. She served as a Marine aboard the USS Rescue in the Pacific and was transferred to Camp Caitlin in Hawaii, the truck corps. In her words, "To free up the men to get slaughtered in the islands." That was a horror that stayed with her her entire life but her career in the corps was the highlight of her life. She did, however, get her pilot's license after the war and went to work for American Airlines as a stewardess.